FINALLY! 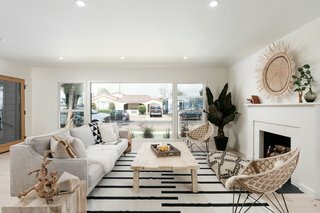 A ‘50s Mid-century ranch with a modern aesthetic done right! Situated on a wide, tree-lined Leimert Park street is this inventive abode by MINI INNO. Enter to a light and airy open floor plan showcased by large picture windows. New recessed lights and wicker pendants highlight matte european white oak hardwood flooring + new energy efficient windows throughout. The enormous chef’s kitchen features matte mint custom cabinets adorned by open oak shelves, quartz counters and stainless steel appliances. No expense was spared! The space begs for entertaining with a breakfast nook, built-in island seating and a formal dining area with custom wood trimmed french doors that open to the patio. BONUS: a powder room off of the kitchen that’s perfect for company! Enjoy generous bedrooms and baths with custom vanities, designer fixtures, hex tiles and marble counters. The master bedroom features his + her closets and an ensuite bath with a walk-in shower + bluetooth speakers. Welcome Home! uploaded Olmsted By MINI INNO through Add A Home.